Debenhams Charity Fashion Show, Scarborough. Even though the Mr and I were heading off to Newcastle the next day, I thought I’d sneak out for Debenhams fashion show. No, not late-night shopping. 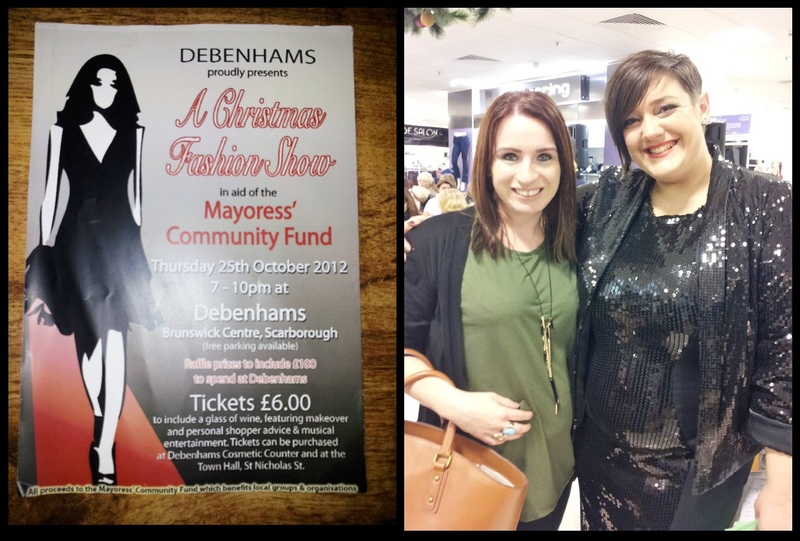 They were holding a Christmas Fashion Show in aid of the Lady Mayors Community Charity, which included a raffle, makeup advice from the beauty ladies and shopping advice from the organiser and Debenhams personal shopper, Audrey Nellist. The evening started well, my complimentary glass of wine was replaced with an orange juice and after grabbing 5 raffle tickets we headed to be seated for the show, en route saying a hello and quick banter with Audrey and her eldest daughter Alexene, whom I went to school with many moons ago – who turned out was hosting the event and had happily put some tickets aside for me! Once at our seats we found a lovely little goody selection, including a beauty card, perfume samples and leaflets. Audrey had put together all the outfits for the evening, which consisted of day wear and evening wear, with the models showing off the latest styles such as the military and country trends. Audrey had chosen a good selection of shapes, sizes and ages of models, which was good to see. There were clothes from Warehouse, Henry Holland, Jasper Conran, Julien Macdonald and Principles. There was an interval between the day wear to evening wear show, where I happily took myself off to the beauty counters to make the most of the free foundation samples, happily taking one from Clarins and Lancome. I then had a walk around the women’s clothes section, where I spotted a lovely dress from Apricot. I’m not normally a dress lover, but I think it’s more about finding the right dresses. But I just had to try it on to see if it fitted the bump, which it did and I proceeded to the till to happily. A lovely lady from Estee Lauder then gave a brief talk on their products and available offers, which included some great information on their perfumes. I never considered Estee Lauder in the perfume area, but I did have to take a trip across to the counter at the end of the evening for a sniff and was very impressed! Another talk was by a lady from Lancome who gave a run through of their products and also some great makeup tips! The raffle was drawn after the show had finished. I’m not normally a lucky person in these circumstances, but I thought with it being for charity I’d buy some tickets, plus the draw of the raffle prizes was too much. The 1st prize being £100 voucher to spend in Debenhams, then other prizes such as bags, chocolate and a Clarins gift box! I’m happy to report that I did win one prize, which I was allowed to choose myself, so chose a lovely weekend bag! The evening was brilliant, the turnout great and was good to see a range of women there supporting a great local charity and I highly recommend the services of Audrey if your wanting help with a new wardrobe or special occasion outfit. A FREE appointment, including I’m told, a ‘cuppa’, can be booked through the Debenhams website. Audrey can also be contacted through her twitter @AudreyNellist. I will definitely be contacting her for my after baby butterfly ‘grown-up’ wardrobe change! Zara Taylor Jewellery, An Obsession. Congratulations on winning the bag! Seems like you've had a wonderful evening. I quite like Estee Lauder perfume, although I haven't had chance to buy any.